The 2015 World Watch List is here. It ranks the top 50 countries where Christians face the worst persecution. 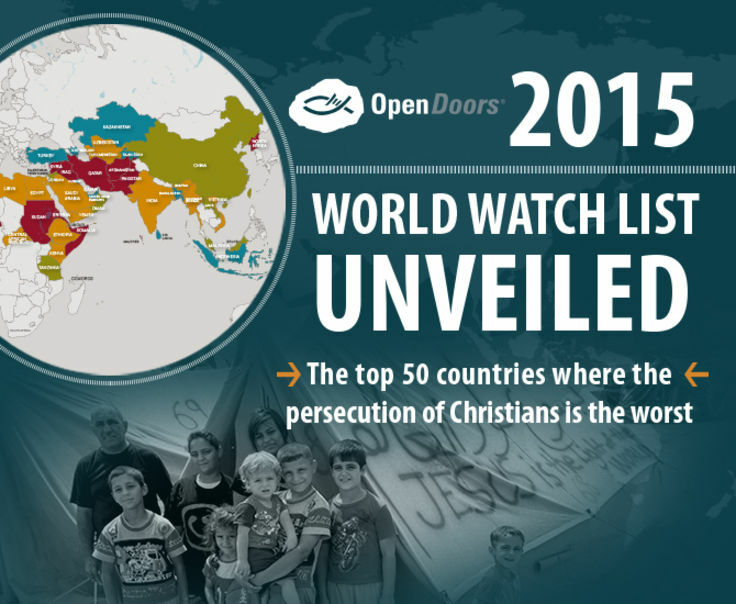 For an in-depth analysis of what life is like for Christians in each of these countries (and why they received the rankings they did), be sure to visit our World Watch List page at www.OpenDoorsusa.org/christian-persecution/world-watch-list/. There you will find trends, pictures, videos and more information on all 50 countries! This year’s World Watch List includes many countries where Christians have been displaced as a result of increased violence. Christians in countries like Iraq and Syria have become refugees indefinitely due to targeted violence against Christian communities. But thanks to your ongoing generous donations, we are able to help these believers as persecution increases. We don’t know all that 2015 will hold or how things will change for Christians living in these countries, but we do know your faithfulness continues to unite the body of Christ in powerful and amazing ways.